There are still 2 days left when you can shop Friends & Family Event at any Banana Republic Factory Store in the United States. Print a special coupon and get 40% discount on your purchase. 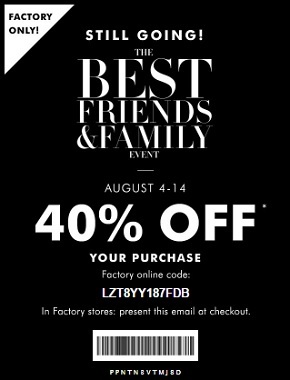 The coupon is available through Banana Republic emailing. Show the coupon to cashier to receive the offer. Source of the information is Banana Republic. Offer expires 08/14/2016. For more details about the promotion visit any Banana Republic Factory Store in the United States.